"For thousands of years, the Nile water has been flowing with God's order," El-Sisi told hundreds of Nile Basin delegates who gathered in the Sudanese capital of Khartoum for the announcement of a deal. "We could cooperate and accomplish great things or disagree and hurt each other…we have chosen to cooperate," El-Sisi told the audience to strong applause. Speaking ahead of Egypt's president, Ethiopia's Prime Minister Hailemariam Desalegan stressed that the Renaissance dam his country has been building to generate electricity for economic development projects would not cause any harm to the Egyptian people. 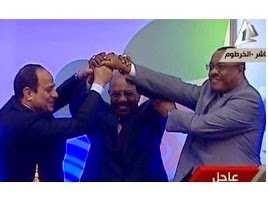 "Egypt and the rest of the Nile Basin countries are "one family," Hailemariam said. "We covered a big step forward by reaching the declaration of principles," Hailemariam said. Ethiopia chose to take the "collaborative path" on the issue of distribution of the Nile water, he added. Speaking last, Sudan's President Omar Al-Bashir stressed on the importance of cooperation to fulfill the development goals of the people of the region. "You are embarking on an historic move… we have taken praiseworthy steps to reinforce and support trust and inter-connectedness between our peoples," he said. Al-Bashir said that the declaration of principles signed by the three countries will be observed by all three, adding that the road has been paved for further talks among all Nile Basin countries to reach a broader agreement. Egypt's President El-Sisi had arrived in Khartoum on Monday for eleventh hour talks with Sudan and Ethiopia as the three countries prepare to sign a tripartite agreement on Addis Ababa's giant Nile dam project. The three countries are also expected to agree on an international firm to conduct studies on the impact of the construction of the dam on flow levels.